Now that an organization as prestigious as The Conference Board has embraced the engagement movement through the creation of its Engagement Institute, we were excited to see what would come out of it. The newly released DNA of Engagement report, previewed here and available to Conference Board members, tracks closely with the framework created by the EEA’s Enterprise Engagement: The Textbook. This report, essential ammunition for corporate practitioners and solution providers advocating for engagement solutions, outlines the core elements of a successful engagement strategy through useful case studies. As you read this, or the actual report, ask yourself what’s missing – we’ll provide the answer at the end of this post. Alignment of business strategy and engagement strategy. An organizational culture that emphasizes a core purpose. Formal programs and policies that drive the engagement agenda. Open proactive, leader-driven communication about engagement. A workplace (physical and virtual) and organizational structure that promotes collaboration and inclusion. A regular cadence for assessment and follow-up. Leaders who are expected and empowered to build engagement. Demonstration of the business impact of engagement. That this tracks so closely with the formal Enterprise Engagement framework in our education program and advocates for the need of formal engagement programs such as we outline is highly satisfying and speaks well of the faculty who contributed to the development of our curriculum years before the existence of the Engagement Institute. The full document, which we read in its entirety, provides more information around these key points. 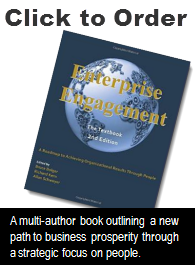 So what did we find missing from the standpoint of Enterprise Engagement? For one thing, there is little mention of learning – the need for people to be continually developed and equipped to reach their full potential. We believe that deserves a key category of its own. Another oversight: innovation. The report talks about collaboration, but hardly mentions anything about innovation, which is not only a key driver of engagement but also a key benefit that merits its own place in the core framework. See this recent blog post on innovation. However, the biggest oversight of all, from our standpoint, is that the report barely mentions the customer, even though one of its case studies demonstrates the ROI of employee engagement from the standpoint of maximizing the customer experience. It gives us great satisfaction that the business leaders behind this report came to many of the same conclusions as we did years ago when we started the EEA, but once again, like their counterparts in Great Britain, this report overlooks the critical connection between customer and employee engagement, not to mention distribution partners and vendors. It brings to light the critical issue of breaking down the walls that exist between HR, marketing, sales and finance that stand in the way of maximizing the ROI of engagement.